In my quest for a more focused, less stressful life & business, I’ve been selling or giving away some of my sites, or just letting them go as the domains expire. Today I have 2 sites that are well aged, have PR and are expiring soon, so I decided to give them away. They have been neglected for years, so they are ready for some action. http://www.yourvirginiahome.com/ – 9 year old, PR1 site. This used to be my husband’s business site when he first started in real estate. It was hacked a couple of years ago, and Google stopped serving ads, and I never tried to talk to them about it (it used to get really good payouts). I haven’t added anything to this site in a couple of years, and it’s not monetized. 1720 unique visitors for 2010. It has some very good links pointing to it, and with new content and some back links could turn a nice profit. 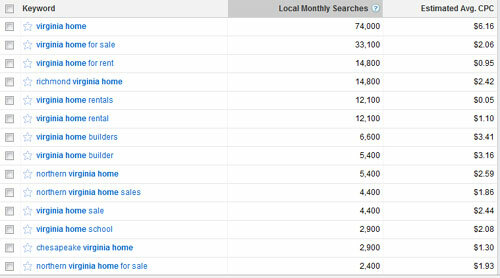 There are good search numbers for “Virginia home” related key phrases. There are lots of searches for variations of Virginia home, and if you decided to go that way, you could probably connect with some real estate offices and sell leads. http://www.youwantthisstuff.com – 8 year old, PR2 site, great name: 1167 visitors in 2010! If you want one of these sites, please comment below and tell me which site you want and why I should give it to you: what are you planning to do with it. On Wednesday evening I’ll decide who gets the sites. Now here is the small print: the sites come “as is” (I’ll take off my ebay info form youwantthisstuff.com, so that will only have the link pages and site template/logo) . I’ll send you the files and the database and you take care of it. If you need help moving he site to your host, it can be arranged for $25 if your host has Cpanel. One comment per person: please don’t spam with comments. I’ll choose someone who has a plan for the site, not based on how many comments you left. Good Luck! 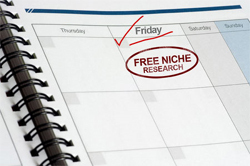 Free Niche Research: Are You In The Right Niche? I am traveling this week, and my internet connection is spotty at best, so this week’s niche is a recap of some of the past niches. Did you find your niche? Or are you still looking for a new niche to explore? Check out these interesting, ready to tackle niches. Let’s do a more competitive niche today: while it’s usually more work to rank , it’s also more likely to be very profitable. I choose Log Homes for our research today: let’s get right to it and see how we can profit form this niche! Many resources are available for this niche: your local builder, a friend/relative who build a log home, specialty magazines, forums, etc. 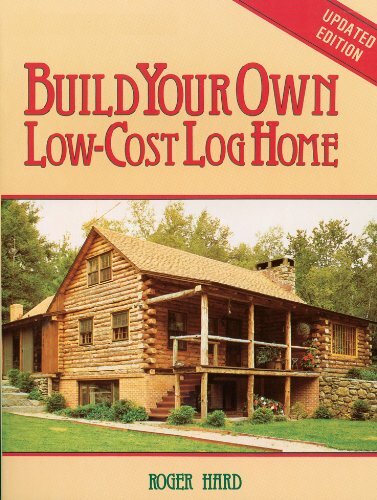 Amazon.com has books, tools, plans, and more for the log home niche. You can also find some ebooks at Clickbank. AdSense payout is amazing! If you enjoy writing, you can make very good money. Of course, don’t neglect your product pages, where you can sell books, tools, magazines, plans and more. You can also build a list: people who build a log home are usually very passionate about the subject, and always looking for a way to make their home better. PicturesOfLogHomes.com ==> 2,900 exact searches a month ==>Excellent opportunity! Easy to crate site, find pictures of log home and and update regularly: you can even invite people to submit their own log homes. People looking for pictures of log homes are probably thinking about building or buying a log home, and there is your opportunity to get them on your list and send them pertinent information. Of course, you can have special pages for log home plans, log home kits, etc. Do you need help with keyword research for your niche? Check out my offer here. I’ve been thinking about starting this blog for quite some time, but I’ve been afraid. I know: why should I be afraid? For one, there are so many excellent blogs about online marketing, and affiliate marketing, and then, I am always second guessing myself. But, I’ve been working online for about 9 years now, and though I’ve had many the ups and downs, I’m still here. I hope that some of my experiences will help and even inspire some of my readers to take action and keep going.